The photographer just happens to be my son Allen, who usually follows Brides and Grooms around with his camera, but agreed to help us out with Flea Market shots. On Thursday morning early, we loaded up Ki's truck and headed to First Monday Flea Market. Ki spotted this western wear craftsman right away. She's a Horse person and gravitated to the western stuff. This vendor is real close to Maggie's place at the Veranda. All his items are hand crafted by him, he's very talented. Then we stopped at the Veranda to visit with Maggie a bit before the meet-n-greet. Ki really liked the shell art done by this gal. You can see more of her things in Maggie's booth. We stopped to take some pics of these quilts and visited with these nice ladies. And Ki signed her Magazine for her. Then off to the Veranda for the meet-up. this is me and Ki with Susie Emmons. 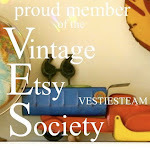 She sells the Vintage Textile Soak that both myself and Ki offer from our web sites. Ki visited with lots of bloggers and lurkers. This is Judy Hill, her sale is June 11, stay tuned for more info. Ki signed Maggie's check out stand," wall of fame". I have to say that Ki is the sweetest person, and took time to truly visit and get to know everyone she talked to. We didn't get to cover as much ground as we wanted. We never got to the Lewis side, or the Arbors. We had so much more to see, but ran out of day. At 5 most vendors close up shop, and that is when we left. I'm sorry if we didn't get by your place, but she may make another visit. More Tuesday, on our trip to Mineola and Gladewater. Cammie and I have decided to have our weekend garage sales only once a month, on the last Weekend of the month, which is today. Since I've had such a busy week, my offerings are not that great but here goes. Be sure to check out Cammie's blog for some really good stuff. And Next month I promise I'll have my act together. See previous post for news about Ki's visit, and I'll have more pictures and stories tomorrow. This item appears to be a ceramic or porcelain spool with a metal clamp on it. I think it was for electricity lines as a tension release or something. This is an old heavy iron pulley. Great rusty patina, nice and solid. this one has a double wheel pulley instead of a single. Pictures tell the story, feel free to ask questions. Measures approx 12" tall and 5.5" dia on the wheel. an old heavy iron pulley. Great rusty patina, nice and solid. $9.50 It's a bit heavy and I'll need to use a flat rate medium sized box to ship it in. I saw so many of these yesterday in all different colors. It is plastic, but I didn't realize that when I picked it up. A can of the spray paint in the color of your choice, changes it up to fit your decor. It's an ornate little shelf, with holes built in for easy hanging $3 plus shipping. Hitch is broken, made of plastic and masonite. Be sure to check out Cammie's, sale to see some more great stuff Garage Sale items. We had a great day yesterday in Canton with Ki and her husband Kerry. I'll have more pics and story to tell later, but here are a few shots to tide you over. Today we will be visiting some local towns and will be in Gladewater at 3:30. Ki got some really creepy pics of these dirty maniquins. A group pic from the Meet-up at Maggy's. Teresa on the left, then Nancy, Eileen, Donna, Margo and Ki. Ki's dad is a Shriner, this hat was very bejeweled, and Ki just had to try it on. Donna gave Ki a special gift. This really touched her Donna. It's a card from a Bible game that says "Ki" How cool is that. I'll have more pics later, we had a great time and I can't wait to share more. Hope to see some of you today. This is your official invitation to come meet Ki Nassauer on Thursday in Canton. She will only be there on Thursday May 28th. We'll be shopping, visiting, and junking most of the day on Thursday. Maggie at The Veranda has graciously offered her location as a meet up point for our bloggers Meet-N- Greet. The Veranda is located on the Canton grounds in a big metal building at roads 43 & 43A - by the creek, just across from "The Porch". She will have some light refreshments for everyone. The meet up time is 12:00 and Ki will be there for about 45 mins to 1hr to meet all of you. If you have a book or magazine you want her to sign, be sure to bring it. Our day will be filled with lots of "things to do" and her schedule is kinda tight. People to meet, and places to go, as you can imagine. Please pray for good weather, not just for us but for all the flea marketers and sellers who need it. Happy memorial Day, and Thanks going out to all our soldiers, past & present. I know you are probably getting stick of guest room updates, but here is one more. I solved the headboard and bed skirt problem. For a bed skirt, I purchased 3 yds of cream burlap at Walmart, and simply tucked it under the mattress. I really liked Deb's idea of layering doilies for a bed skirt. I think it's for a basin to sit in. I've got to find one the right size. It swings out and back in. Here's the inside of that white cabinet, that I love. Look at all those cubbies. Can anyone tell me what this was before it was a vase? Here's a close up of one of my re-purposed lamps. Now I have a story to tell about this one. I originally used one of those great old trouble light cage lamps I got. But the wiring was so old that it short out, with quite a scarey spark. I decided to use it elsewhere, and got this industrial spot at the Home store and just attached it to this old butter churn. As promised this is how I made the book holder. Basically I screwed the hinges to a block of wood, about 1" thick and the size of the book. Used some glue to freeze the hinges in an L shape, and slipped the book inside. Then put a hanger on the back wood. The wooden block is not visible because of the frames that i put it all inside. And I was also asked how I hung my old corbels. First I screwed a piece of metal strapping tape (found in plumbing dept) to the back of each, curving it a bit. Then I screwed a screw into the wall into a stud, and simply hung the corbel on the screw in the wall. Thanks to all my faithful followers for your encouragement through this process. Here are wide shots of the room. I'm sure I'll change things around often, because that is what I do. But here is how it is right now. It was real fun to put this together with the theme of Industrial with a Cottage Twist. Hope you like it. I've listed some of the prices I paid, so that you can see how economical decorating with junk can be. However there are a few key pieces that I was willing to pay a little more for. The windmill and dress form in particular. But I think you'll agree that those 2 items really add to the room. Don't be afraid to pay a little extra for a statement piece that speaks to you. You'll be saving loads on other pieces so you can afford to splurge here and there. The room has 2 windows and I covered each one with a topper using an old burlap coffee bag, cut in half, and hung by old hinges, See past post. The cabinet below is really cool when you open the doors, it is full of little cubbies, i'll show pictures of it later ($35 ), I added the feet. I picked it up more than a year ago, It's been in the barn. I found the rocker 2 weeks ago for $5. The metal candlelier was an item I traded another dealer for. It's a fun piece. And an old shopping cart as a hamper. Wooden hinges and a valve handle accessorize the top of the cabinet. I've had the dresser below for at least 2 years, holding it for this room. I paid $5 for it, and painted it white and then distressed it. The mirror above it I've had for at least 5 years. The framed pieces on either side I've shown before. I'll give instructions on the book holder in a later blog. The red vanity had no top or front or mirror, I paid $10 for it, I used a piece of masonite, cut to size and decopaged old dictionary pages to it for the top and front piece. The mirror is off of an old medicine cabinet, and I screwed it onto the old mirror frame. Old Corbels (traded with a dealer) hang on either side of the large topographical survey map of Louisiana( $2). Above the bed are parts from old fans that I pulled from my booth. The cabinet on the left is a medical cabinet of some sort($20). It has a unique feature that I'll show later. The table on the right was a transmission stand from an old car shop. I attached an old marble top to it and now it's an industrial side table. I made the catch-all on the right from an old ammo box lid, and various hardware, and on the left is an old chippy door, complete with hinges, and knob. The lamps are re-purposed trouble lights. I know I still need a headboard but that will have to wait for now. I went with a cream matelase coverlet, I'll add color and interest with pillows and possibly a quilt or throw at the foot. I still need to get a dust ruffle. The tray on the bed was found last weekend, at a sale. Several items were aquired recently, with this room in mind, not knowing that it would be empty so soon. But some items I've had stored in the Barn for years. That's the fun of junk decorating. I know I could do a lot more with the floor space and walls, but I don't want to overwhealm my guests. Afterall, they won't all "get it". Hope you've enjoyed this room makeover. I had such fun, working with what i had and purchasing bargains with this room in mind. It's almost done, I still need a bed skirt, and the carpets are getting cleaned on Friday. I've got a few more sneak peaks for you, then I'll reveal the whole thing this weekend.